For ease of use and safer handling, we offer both Hoechst 33258 and Hoechst 33342 dissolved in H2O at 10 mg/mL. Hoechst dyes are cell membrane-permeant, minor groove binding blue fluorescent DNA stains. For ease of use and safer handling, we offer both Hoechst 33258 and Hoechst 33342 dissolved in H2O at 10 mg/mL. Hoechst dyes are cell membrane-permeant, minor groove binding blue fluorescent DNA stains. Hoechst 33258 and Hoechst 33342 are spectrally similar. 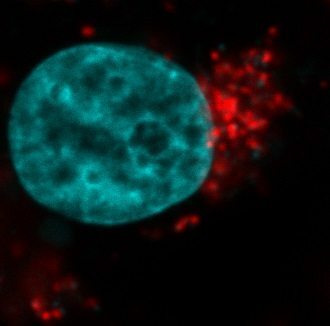 Hoechst 33528 is slightly more water soluble than Hoechst 33342, but both dyes are widely used in cell cycle and apoptosis studies and also as nuclear counterstains. They are typically used to stain live or fixed cells in buffer or medium at 1 ug/mL, with no wash step required. 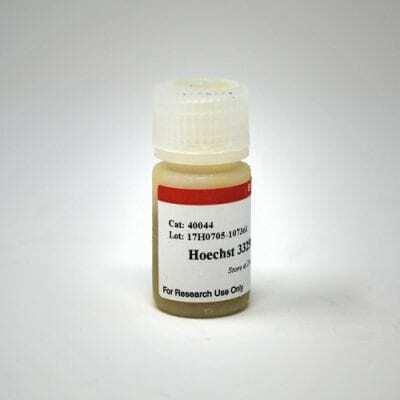 Hoechst can be used to stain live bacteria (gram-positive and gram-negative) but in live yeast the staining is weak and not nuclear. See our Cellular Stains Table for more information on how our dyes stain various organisms. Learn more about Hoechst and our other novel nuclear stains.